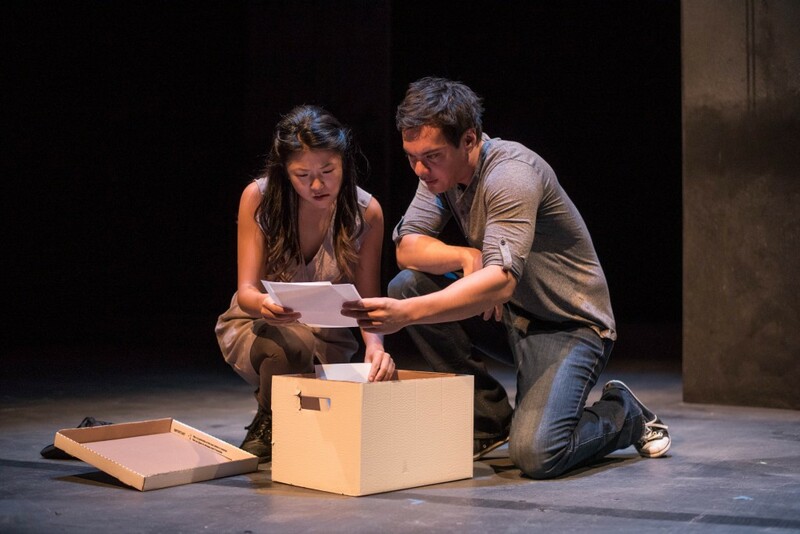 Rosie Simon as Nine (left) and David Yee as Sin (right) underscore the point gain can be greater than loss when it’s time to say goodbye in the Factory Theatre presentation of acquiesce on stage until November 27. Poor Sin (David Yee). When it rains loss, it really pours. And while saying goodbye to a girlfriend can have the same psychological effect as a death occurring, add in the passing of an estranged father being buried in a foreign land and one can find themself feeling awfully alone in this world. That’s not to say bereavement dominates this mostly funny nevertheless deeply touching cross-ocean journey of acquiesce, the 15 year old revised work that almost never saw the light of day. On the contrary, the process of deprivation always seems to trigger some level of discovery deep from within. For one successful author en route to China, there’s an awakening on the horizon playgoers can never see coming. Sin’s relationship to Nine (Rosie Simon) is a complex mixture of love and resistance. Is it pride or obstinacy holding preventing a deeper bond? She speaks the words he never seems to hear. Without her, motivation may not exist. Upon arrival in his father’s homeland to stay with a distant cousin, Kai (Richard Lee), there’s a test of all tests awaiting him as he prepares to lay the body to rest. Language, customs, and a crazy little thing called duty ignites a placid consciousness of the cycles that we’re are all part of. Multi-character contributions don’t get any finer than what John Ng accomplishes in this immensely pleasing staging. From offended airline passenger to Monk on a mission to scarring paterfamilias, he’s bona fide theatrical treat to watch. David Yee may not be the considered the most bankable actor in a city of veteran performers but you wouldn’t know that in his latest stage appearance. Few artist’s could navigate their way through the text as grounded as he does given the emotional investment he has with the piece. As playwright and actor, what he does, he does extremely well in advancing culture. It would be disappointing not to see acquiesce get its fully deserving Dora Award nod when the spring announcement is made. Comedy confronting tragedy in such an enlightening way is derserving of a municipal holiday for it’s achievement.